Why the difference in a 50 yard load and a 25 yard load for 45 ACP? I'm new to the 45, haven't bought one yet, but will soon and I've been researching people's choices for loads for their 45. I've noticed they have a 25 yard load, and a 50 yard load. Wouldn't the 50 yard load do just as well at 25 yards? Not all of us shoot a different load for 25 vs 50. In fact, I think most shooters (not just the people here) shoot the same load at 25 and 50. The reason is to have a lower recoiling load for the timed and rapid fire stages. Is it not possible to get a lower recoiling load for 50 yards as well? And with the difference with two loads you'd have to change your zero (one for one load, and one for the other). 1) The 50yd load is optimized for accuracy whereas the 25yd load is optimized for reduced recoil with reliable function. Since it is easy to get x-ring accuracy at 25yds, some guns will allow a MUCH softer recoil load for the 25yd line. 2) "...do just as well..." in the context of accuracy would be yes. However, for some people, the reduction in recoil might mean slightly higher scores. My primary gun likes JHP and I shoot the same ammo at 50yd and 25yds. My backup gun likes LSWC bullets and I use different loads for it. And yes, most people who use different loads have to adjust elevation when going back & forth from long line to short line. A little experimentation will tell you how many clicks. Tim:H11 wrote: .... with the difference with two loads you'd have to change your zero (one for one load, and one for the other). Actually using the same load for 50 & 25 you might have to change your zero - anywhere from 3-5 clicks depending on the load and the distance your sights/dot is mounted from the barrel centerline. Example a 45acp 230gr bullet @ 830fps will drop about 2.3" from 25 yards to 50 yards. Some people tune their loads so they don't have to adjust their sights, I tune for recoil and have to adjust my sights. I use the same load for both. With irons and a sub-six, I don't usually need a sight correction. It's the KISS system in every way. There are those that say they don't have to adjust zero from 25 to 50, ive tested many 45 combos of loads and have not found a single one to do this and be as accurate as possible. I have found that rule of thumb is if shooting the same bullet and load for both 4-6 clicks up from 25 to 50yds ( using a ultra dot) gets you close or in the 10 ring. My current load takes 4 clicks its a 185 lswc w/3.9 gr of bullseye powder, .468 crimp. How do you measure crimp? I reload just for plinking and use "factory crimp dies". DavidR wrote: There are those that say they don't have to adjust zero from 25 to 50, ive tested many 45 combos of loads and have not found a single one to do this and be as accurate as possible. I have found that rule of thumb is if shooting the same bullet and load for both 4-6 clicks up from 25 to 50yds ( using a ultra dot) gets you close or in the 10 ring. My current load takes 4 clicks its a 185 lswc w/3.9 gr of bullseye powder, .468 crimp. Yes, I agree.. The zero changes thru out the match.. The body tires, the hands shrink or swell, the stance and inner core weaken... Read your backer as the match progresses. The first several shots at 50, as the match begins are super important to read and call .. Many points are lost on that first ten shots until the zero is confirmed or re established..
Tim:H11 wrote: How do you measure crimp? I reload just for plinking and use "factory crimp dies". Use a dial caliper right at the rim see picture below. I use Lee factory crimp dies, you can adjust them so they give you the crimp you want. You see a difference in group by crimping more or less? 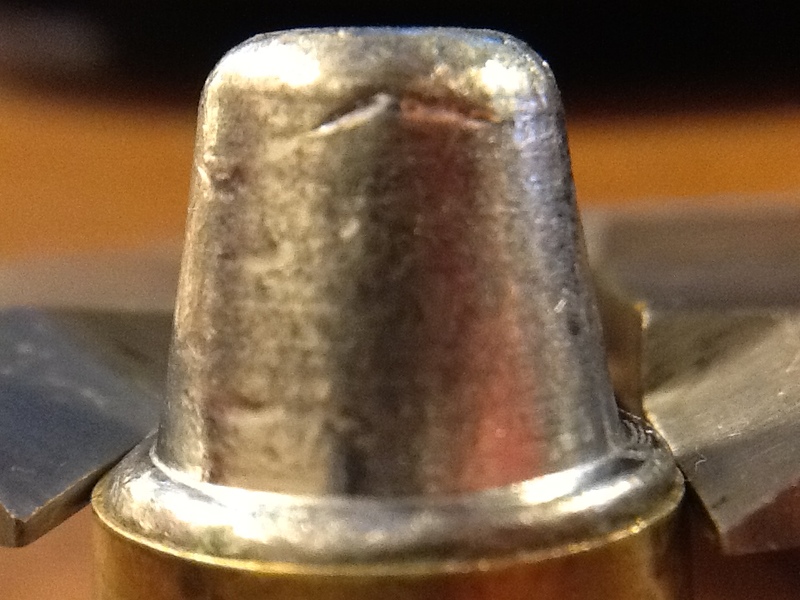 Tighter crimp, more pressure. More pressure, higher muzzle velocity. Higher muzzle velocity, different point of impact. More crimp, more efficient, complete, powder burn with some powders. Tim:H11 wrote: You see a difference in group by crimping more or less? Yes and no. Some bullets it makes a big difference at 50 yards. For 25 yards or 50 feet, I just crimp at .469" and forget about it. You are hurting accuracy if you are not crimping in a separate process from seating. If just plinking then that's fine but not for the best accuracy. Soft lead swaged bullets .469, hard cast I go as low as .467, most times I split it at .468, they feed and shoot well, too loose a crimp you get feeding issues.